Are you interested in starting some home improvement projects this fall? Are you motivated to do something but not quite sure on what to do? Or, maybe you’re looking for home improvement ideas that don’t cost you a lot of money? If you answered yes to any of those questions this article is for you. 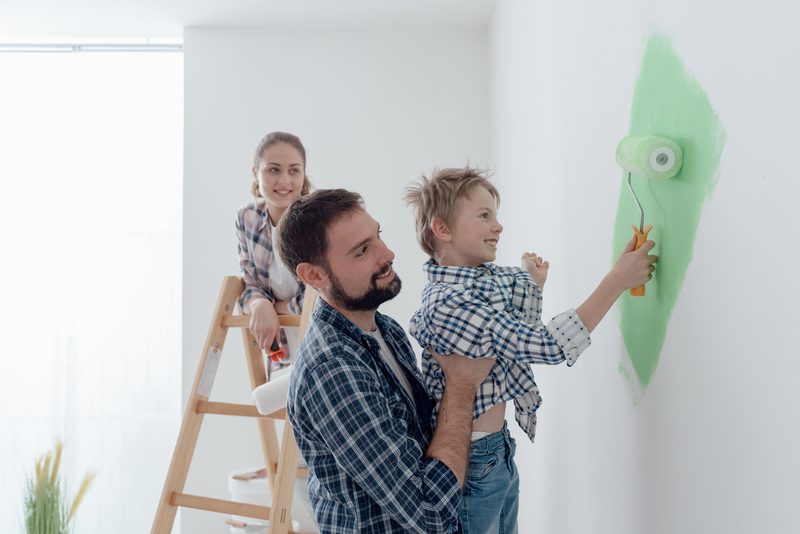 While fall is a season to admire the color change while sipping a pumpkin spice latte it is also a great time to dive into some great home improvement projects. Today we will explore 7 ideas on timely projects you could try this fall here below. Painting your front door can help your house stand out, and can be finished quickly and inexpensively. A front door is often the primary point of entry into your home, so it makes sense to want it to look great. Giving your front door a fresh coat of paint is ideal for the fall when temperatures are around 50 to 60 degrees. These temperatures allow the paint to dry and stick to the door properly. Clogged gutters in the winter can build up into ice which could damage the gutters, so why not get in front of the problem in the fall. Moisture is a big problem when maintaining a home and making sure your house can properly get rid of it is paramount so your wood doesn’t mold and mildew. Making sure your gutters are clean ensures they can work properly to carry water away from your home and prevent water damage. With mild temperatures, the fall may be an ideal time to clean the gutters if you’re up for the task. According to the American Society of Landscape Architects, fire pits are currently one of the most popular outdoor elements you can design. Fire pits are great for get-togethers with friends and outdoor activities, and it’s quite easy to build one yourself. Imagine roasting marshmallows and eating s’mores around a starry fall night with a couple of friends sipping a hot chocolate or your favorite drink. If you interested in building a fire pit look at this step by step guide provided by realtor.com. Accent walls are currently popular in American households and can add a unique personal touch to your home. Generally, an accent wall is the first thing you see when you walk into a room. Accent walls can be an inexpensive way to perk up an otherwise boring space and may be a great solution for your home. These accent walls can be a great addition to your living room, bedroom or family den. For more information and a step by step guide to painting your accent wall, check out this article by True Value. If done correctly power washing your house can increase your home value and curb appeal depending on how dirty the siding was before and how clean it becomes after. It’s relatively easy and the fall can be a great season for outdoor projects such as these. In about 2 to 3 hours you can breathe new life into the look and feel of your siding and deck. However, power washing is not something you want to do too frequently as it can actually degrade your paint if done too often or at a that is too high. And don’t forget to repair any damaged areas first. It’s true, power-washing can be easier than painting the whole exterior of your home depending on your skill-set, and power-washing is often cheaper. For a complete guide on power-washing your home, you should check out pressurewashr.com. Here you will find an in-depth article on power washing your home. Insulating your attic before the winter could potentially save you as much as 15% to 25% on your energy bill according to the home improvement site the familyhandyman.com. And while it may be sweaty and dusty work it could be well worth its salt by saving money. Also, you may even qualify for a tax credit in your attic insulation cost for improving your energy efficiency. Check out energy star for more details on this potential energy tax credit. If you’re interested in improving your energy cost insulating your attic can be a great choice you may be able to do for yourself for less than $1,000 depending on the size of your home. The fall is ideal for projects like this due to the mild temperatures. If you’re interested in insulating your attic visit Familyhandyman.com for a step by step DIY guide. A fireplace can be a nice way to add warmth to your home. According to the National Association of Realtors list for home buyers, 40% would pay more for a fireplace. This means not only could you enjoy the warmth and interior design of a fireplace you could also potentially increase the perceived value of your home. How much do you ask? Well, fireplaces have been found to increase your home value up to $12,000. That’s a pretty great ROI for something that may only cost you $2,500 or less. Now if you’re not into construction this may not be a project you would want to attempt yourself although there are plenty of contractors that you can work with you on your fireplace installation. If you’re looking to find a contractor for your fireplace installation just type in “Fireplace installers near me” on google. However, if you are into DIY projects, have no fear you can visit the E Fireplace Store to discover all you need to know to install a fireplace and perhaps even find the one you want to buy. All in all, fall is a great time for home improvements. Hopefully, these ideas gave you the inspiration to get out there and increase your home values. And if your funds are low and ambitions are high you can always apply for a home improvement loan from Mariner Finance today! Still, need more inspiration? Check out our other article: Tips for Preparing your Yard for Fall and Winter.